Sam might have kept a straight face while he disassembled those bomb-handed baddies, but his makers at Croteam have remained resolutely silly throughout their 20-year history. Until now, it seems. The Talos Principle is a first-person game about solving increasingly tricky puzzles woven into, and I quote, a metaphysical parable about intelligence and meaning in an inevitably doomed world. Croteam have found a crack writing team for the project. Tom Jubert wrote for FTL and The Swapper, and also did stellar work on Driver: San Francisco’s in-car dialogue and Penumbra’s disturbing letters. Jonas Kyratzes did terrible, creative things with monitors in escape-the-room game The Infinite Ocean and wrote long conversations with turtles for The Sea Will Claim Everything. Together, they’ve put together this odd world in which we – an advanced AI – will prove our worth “beneath an ancient sky”. Unseen creators have plonked us in “digital recreations of humanity’s ruins”, and handed us the means to divert drones, disable turrets and replicate time. In doing so, we’ll solve some 120 puzzles in Croteam’s Serious Engine 4. Intriguingly, the developers have been experimenting with scanning real-world locations and historical features and recreating them in-game. Does that sound like something you’d be interested in? 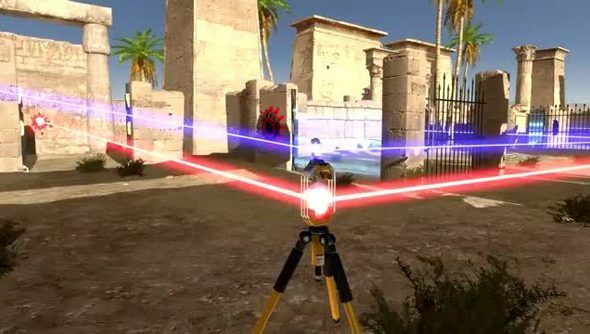 I guess we should be looking forward to newly-detailed pyramids in Serious Sam 4.